Mentioned is the way you can write. People looking for jobs can easily download these BS-SE (software engineering) Resume Template in word or pdf format or just view it online to copy and paste. 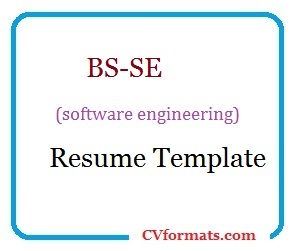 Cover letter of BS-SE (software engineering) Resume Template is also available. Just change the name , address , qualification and experience and your BS-SE (software engineering) Resume Template is ready. • FSC (premedical) from Govt. College Peshawar. • Matric from Peshawar Model School, Peshawar. • Certification in Web Designing and Management Information System (MIS) development. • Certification in Oracle DBA (Database Administrator) , from Subhash Educational Complex, Peshawar (Progress). • Certification in Oracle Developer , from Subhash Educational Complex, Peshawar (Progress). • Hardware / Software troubleshooting. • MIS (Management Information System) development.